Learn how to really make an impact with a world-class groove master and drummer with Prince. John Blackwell helps you develop the astounding playing technique he has become known for, including key exercises that he used as a student and still uses today. John covers how to build a solo, single hand drum rolls, single pedal technique, and much more. He also shows, in detail, his amazing stick twirling technique, and explains how he was influenced and inspired by heroes like Lionel Hampton, Sonny Payne, and Gene Krupa. 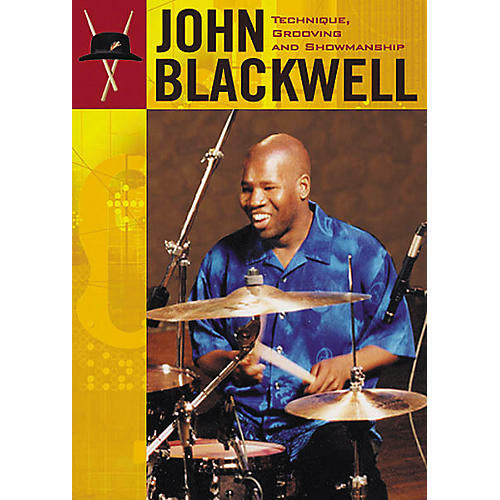 Also included on the drum lesson DVDs is incredible footage of John Blackwell's performance at the Modern Drummer Festival 2002 with his band Matrix, featuring Tom Coster, Baron Browne, and Bruce Bartlett. A great segment on grooving features John in the studio with Baron Browne on bass, playing and discussing styles that include funk, jazz, blues, and funk ballads. Special DVD features: a camera-switching option, optional commentary by John, historic clips of some of John's biggest stick-twirling influences, with a narration by John, interviews with John and with his father backstage at the Modern Drummer Festival 2002, a photo gallery, and more! Running Time: 4 hours. Act fast, you're sure to see big changes in your playing.